Disclaimer: the views, opinions, and observations in this post are my own and do not reflect the official position of the Fulbright Program or US Department of State in any way. I’ve been in South Africa for two months now. I was originally placed at a high school in Atteridgeville, where I taught English for grades 8-12. The students were incredible, so eager to learn, and they definitely made the 10 hour workdays worth it. It was a joy to teach them. I learned so much about myself and what I have to offer. I also started a martial arts club there, which was an equally rewarding experience. Those kids picked up their training principles and kicks so quickly. I only wish I had been able to spend more time there, but unfortunately, due to extenuating circumstances and safety concerns, the embassy decided to move us (the other Pretoria ETA and me) to a school in Pretoria as a temporary assignment. This location is a ten minute drive as opposed to 45 minutes and the school is very secure. We worked as English assistants for 3 weeks and after our upcoming school break, will be moving to Cape Town to work in the writing center at Cape Peninsula Technical University. I have enjoyed my time at both high schools, but am greatly looking forward to the stability that will come once I am in Cape Town. I wasn’t too sure what to blog about, but since I felt like I owed everyone an update, I decided to do a post about some of my favorite lessons that I have done thus far. They aren’t in any particular order. I had the students make large index cards for each of the recurring characters. This was an ongoing process as students had to update the cards every few chapters. The goal was to show how characters develop throughout the book. For example, when we first learn of Boo Radley, he is mysterious and his reputation has been tarnished by rumors. As the book continues, however, Boo demonstrates kindness toward Scout and Jem, and we see a different side to his character. These cards were also an exercise in providing evidence. Rather than simply writing that a character was mysterious or kind, student had to give examples or quotes. 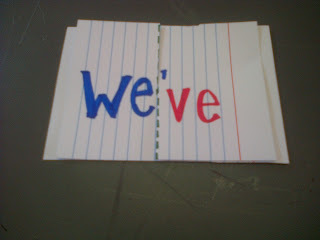 Students also made vocabulary flashcards for the more difficult words that came up in the text. We played a matching game where students were paired together and one person put their cards term side up and the other definition side up. Students took turns making matches a bit like the game “Memory.” We also used the vocab cards as the basis for “Heart Attack,” a game I played in my French classes in high school (though we called it Crise Cardiac). Students are divided into teams. One person from each team goes up to the board and once the definition is read, students race to write the board. Spelling counts. The first person to complete the word, turn around, and wiggle their fingers (or say Quack Quack as Madame made us do) gets a point for their team. I had my students play Heart Attack with contractions. 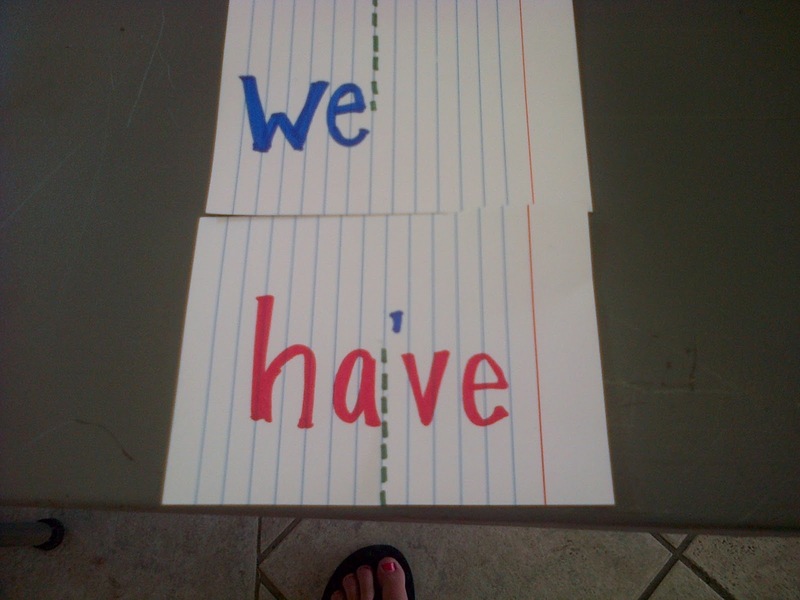 I gave the two words and they had to write the contraction or I gave the contraction and they wrote the two words. They loved it and were so competitive! I also let my grade 8’s play this game (I had 57 in one class and I forgot how many in the other grade 8 class—it was more than 40 though) but they had to copy down two charts of contractions and write 5 sentences using a contraction properly first since contractions were a newer skill for them. My fellow ETA, Dai, did contraction game at our second school. Index cards are partially cut down the middle so that the two cards can be joined to form a contraction. I’ve posted pictures below. Following a unit on parts of speech, specifically nouns, verbs, and adjectives, I read the kids Clifford the Big Red Dog. They thought it was funny. After reading it through once, I read it a second time and had the kids tell me the parts of speech. We did a similar exercise with The Giving Tree, though this book was also good for comprehension—to see if the students understood the message of unconditional love. We also read one of The Magic Tree House Books. Excellent, educational chapter books—they were also quite popular with the students at Mae J (the library I volunteered at). I started with a lesson on paragraphs. I gave the students library books and asked them to identify the topic sentence, main point and supporting evidence of the paragraph. I then had them write their own paragraphs. One student wrote a very informative paragraph about trees and another wrote a poem about a turtle. Technically, she had all the required components, and I have a few MFA friends who I know would have been very proud. From there, I did an example of a paragraph with tangential information and we talked about cutting irrelevant information from our paragraphs. That wasn’t a huge issue with the kids writing. Looking back, they had the opposite problem, they wrote too little, but being able to identify whether or not information is relevant is a useful skill. We then discussed how to outline an essay by making a mind map and discussed how to construct a thesis statement. This was probably the least fun part of the segment for them, but hopefully they will thank me for it one day. To conclude, I have to say I love being in front of a classroom. It’s funny how some of the sayings I learned so long ago come back to me without missing a beat—the definition of a noun—a person, place or thing, for example, or random facts about American history. One of the classes at the second high school had a reading passage that referenced an Achilles heel. They didn’t know what it meant, so to explain it. I started with the Greek mythology/history of the term, then the anatomy, then what it meant as an idiom. I did this all off the cuff too. One of the kids asked me if I was a genius. It’s those moments that I have cherished the most, the moments when my education has clearly made me a better teacher to help my students. I am truly grateful for this opportunity. On the radar: a trip to Durban, moving to Cape Town in early April, starting a martial arts club at a high school in Cape Town, and going to a Fulbright conference in Ethiopia right before my 23rd birthday.